Brown bullhead. Caught in Seneca County, New York. Photo by Arthur Masloski, January 2009. 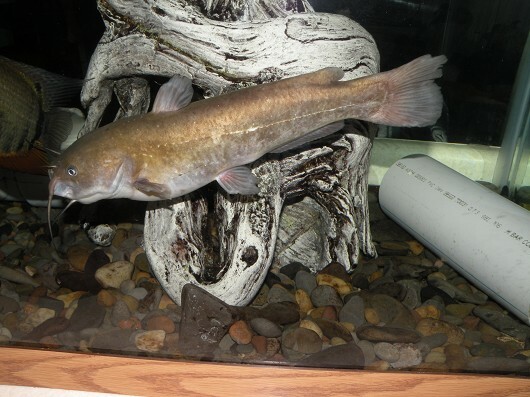 The Brown Bullhead is an extremely adaptable species, finding niches in a variety of habitats from warm turbid sloughs to clear mountain lakes. In California they are found mostly in larger bodies of water, like foothill reservoirs, where they stay towards the deep end of the littoral zone, near aquatic plant beds and muddy substrate. When found in rivers, bullheads prefer slow moving, low gradient, turbid streams with deep pools, aquatic plant beds, and soft bottoms. This diversity of habitat use comes from the species’ resilient nature. Bullheads can survive in temperatures that range from 4°C to 37°C, salinities as high as 13 ppt, and alkalinity levels up to a pH of 9. Incredibly, they can also survive in water with less than 1 mg/L of dissolved oxygen by becoming torpid if in cold conditions and gulping air in hot conditions. Bullheads feed at night in groups, sometimes organized under a size-based hierarchy. These groups swim close to the bottom, running their barbels along the ground detecting potential prey hidden by debris and murky waters. For young Bullheads this prey consists mostly of midge larvae and small crustaceans but their diet will expand to larger insect larvae and small fish as they get older. These are only the more common prey examples, however, as Bullheads are incredibly opportunistic, eating nearly anything that can fit in their mouths. Bullheads usually reach sexual maturity by age 3 and spawn in May through mid-July when water temperatures have reached 21°C. After a courtship ritual, a female will deposit 2,000-14,000 eggs in a nest she has constructed previously using natural depressions. Once the eggs are fertilized the parents will protect them from predators and other bullheads while stirring the water around the eggs to increase oxygen levels. The eggs hatch 6-9 days later but the young stay in the nest for up to a week more feeding on their yolk sacs. At this point the young become free swimming but stay together in a tightly packed ball protected by their parents until they reach 50 mm in length. Over the next year they will grow rapidly, reaching 7-10 cm by the end of their first year. The largest individual recorded was 53.2 cm long and weighed 2.2 kg but it is rare to have a Bullhead longer than 30 cm or heavier than 450 g.